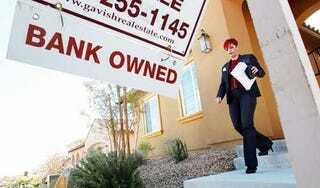 ProPublica reports a baffling statistic regarding Congress' plan to help homeowners facing foreclosure. The "Hope for Homeowners" plan, launched last summer, was set to help 400,000 homeowners from joining the ranks of the dispossessed. To date, it has managed to help just one homeowner. ONE. How does that even happen? That's only slightly less difficult than helping a negative, imaginary number worth of people. F minus, Congress. F MINUS.